The Pulitzer Amsterdam and the Prinsengracht. 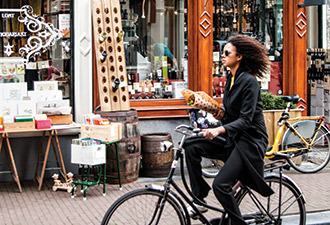 Six hoteliers on where to eat, drink, shop, and pedal around Amsterdam. 1. Head to the A’dam Lookout at the top of the 21-story A’dam Tower, where Europe’s highest swing offers thrilling city views. 2. Try a shot of jenever [Dutch gin] that can be poured straight from the barrel at De Drie Fleschjes, Amsterdam’s oldest tasting room. 3. Café-Restaurant Stork, in an old loft on the river IJ in the north of Amsterdam. It has great views of the water and is the best place in town for a lovely seafood dish. 4. In a stunning Dutch neo-Renaissance building, the Rijksmuseum, which reopened in 2013 following a ten-year renovation, features incredible interior design and immersive exhibits dedicated to arts and history in Amsterdam. 5. The farmers market on Noordermarkt is the place to be on a Saturday. It originated in the seventeenth century as a market for utensils and other household items; today, it’s colorful and lively, surrounded by cozy pubs and restaurants. 6. Castle Muiderslot, a 30-minute drive east of the city, dates to 1285, when Count Floris V commissioned its construction. 7. Don’t leave without a box of Dutch stroopwafels, crispy waffle-caramel cookies that make great gifts. We bake our own, which can be purchased in our boutique. 8. The Anne Frank House is a biographical museum dedicated to the Jewish war-time diarist. After your visit, I recommend a stop at the nearby Noordermarkt to try a slice of the apple pie at Winkel 43. 9. In the west of Amsterdam, Partisan is a laid-back place where you can meet for dinner or drinks. Their menu is an interpretation of modern bistro fare. 10. A 35-minute drive north, Zaanse Schans is a historic neighborhood in Zaandam with a collection of eighteenth- and nineteenth-century windmills and houses. Stop by the workshop where wooden clogs are made. 11. The book Little Kingdom by the Sea, a Celebration of Dutch Cultural Heritage and Architecture contains the moving personal stories hidden behind the facades of the miniature replica Dutch canal houses that KLM Royal Dutch Airlines has gifted to its business-class passengers since the 1950s. 12. A canal cruise lets you get away from the hustle and bustle while floating through different parts of the city and enjoying the wonderful views of the historic seventeenth- and eighteenth-century buildings. 13. Vuurtoreneiland is a small island and nature preserve that’s home to a restaurant of the same name. You can take a boat there for an organic five-course meal overlooking the water and the island’s tiny lighthouse. 14. The espresso martini is a trendy vodka-based cocktail that can be found in all high-end cocktail bars – it’s especially popular among Amsterdammers. An espresso martini at Bakers & Roasters. 15. The Dutch beaches, ideal year-round, are a 45-minute drive from Amsterdam. 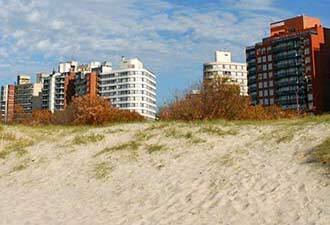 One of those sophisticated coastal towns is Noordwijk. Its stretch of beach, colorful flower fields, and beautiful dunes make it a refreshing place to unwind and relax. 16. The perfect place to discover the city’s vibrant atmosphere is at the famous Nine Streets [Negen Straatjes], a UNESCO World Heritage site located in the middle of the canal belt. The streets are home to many exclusive fashion, design, and home decor shops. 17. For those with a passion for art and culture, one of Amsterdam’s most special areas is the Spiegelkwartier, home to 70 antiques dealers and galleries selling classic and contemporary art. It’s definitely worth a visit. 18. I love to cook and enjoy dinner outside with a view over the canals. And if it’s sunny, it’s just a short drive to the beautiful beaches of Zandvoort and Noordwijk to enjoy the sunset. 19. Café ’t Smalle is one of the few bars in Amsterdam where you can sit with a drink outside near the canal. A cultural site that locals know about is Museum Ons’ Lieve Heer op Solder [Our Dear Lord in the Attic], a seventeenth-century canal house and church. 20. The Kröller-Müller Museum, an hour’s drive east in Otterlo, is home to the world’s second-largest van Gogh collection [the largest is at Amsterdam’s Van Gogh Museum], with nearly 90 paintings and more than 180 drawings. Its sculpture garden is one of the largest in Europe. 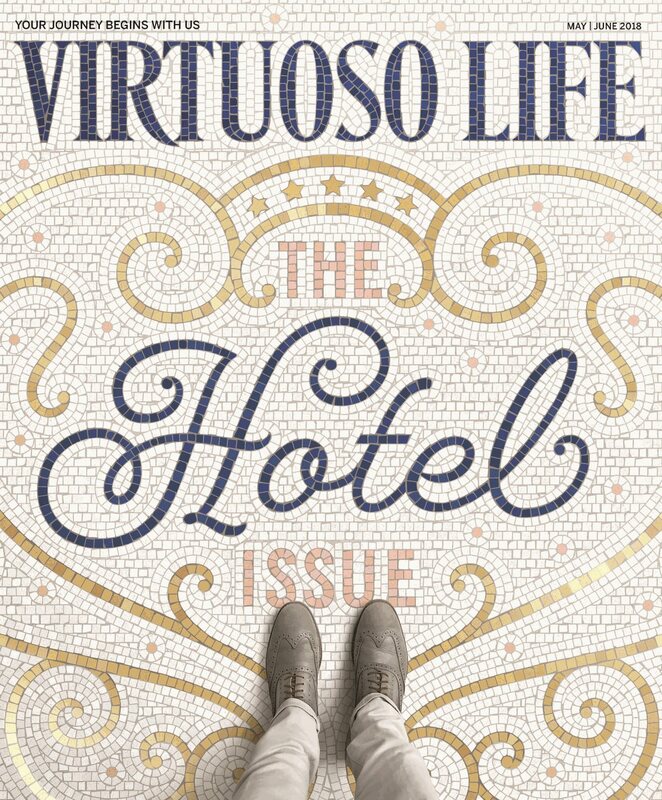 This article originally appeared in the July 2018 issue of Virtuoso Life. 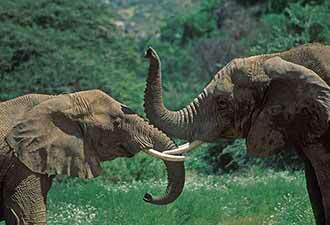 How can your travel actually save the elephants of our world?